The Seville range is our Premier Selection featuring Round Weave and Half Round weave, used together to form beautiful products. Designed with both style and comfort in mind, Seville not only looks good but is very practical. 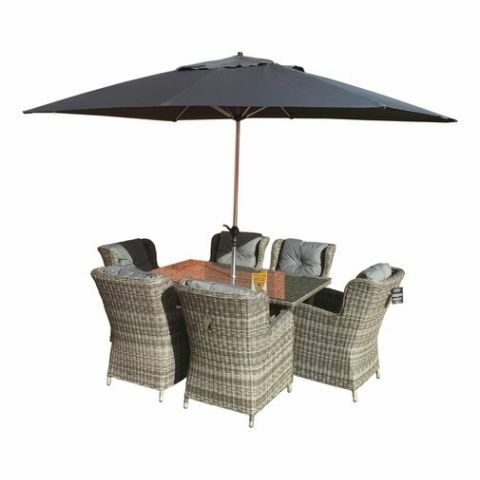 Strong aluminium frames provide strength with light weight and 6mm Rattan Weave provides good looks and comfort. The cushions are 100% Polyester using a higher quality of fabric than our other ranges and of course these are fully compliant with Furniture Fire Regulation BS5852. 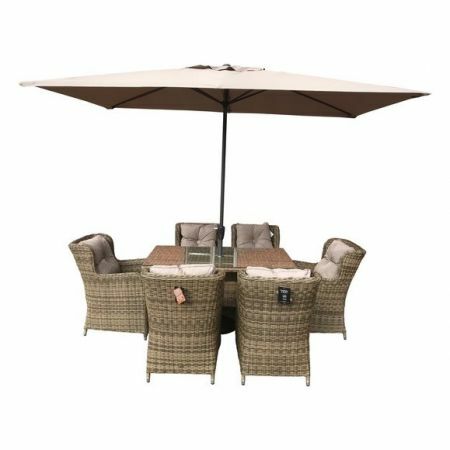 Like all of Katie Blake's Garden Furniture range, the Seville Collection can be left outdoors permanently, requiring no maintenance except an occasional wash with warm soapy water or a pressure washer. Cushions and parasols, whilst shower resistant, should not be left outside, however, otherwise some deterioration will occur. Write a review about "Seville 6 Seat Set with 1.50 x 90 Rectangle Table - Natural Weave with Taupe Cushions"